The history of Burke and Hare provides the perfect frame for a Doctor Who story, and it’s quite surprising that it hasn’t been explored before now, but new writer Robert Ross makes amends for that omission by successfully recreating the period in a pseudo-historical tale that never forgets its science fiction roots. 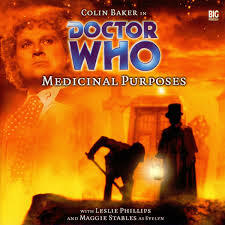 There’s an undercurrent of dark comedy to proceedings, amusing highlights being the banter between the Doctor and Evelyn and even some of the situations they encounter such as the Doctor being propositioned. Unfortunately, the overall tone of the story is one of the biggest issues because events continue to shift from humourless and harmless to extremely grim and grisly without truly managing to achieve a middle balance. Burke and Hare themselves, both enjoyable though written as truly evil and malicious characters, end up being the biggest example of this lack of subtle balance since the comedy they try to put into their conversations simply feels crass and jarring when paired with their actions. Doctor Robert Knox, played by Leslie Phillips, becomes an intriguing central antagonist and provides a nice counterbalance to Burke and Hare, though unfortunately he is written as a stereotypically evil mastermind with an overly complicated plan. Phillips proves adept at bringing across the sense of self-importance, arrogance, and ultimately unpleasantness that the character demands, though he also injects a sense of eccentricity and even some subtle levity to make him slightly more nuanced overall. The story itself never seems quite sure which direction it wants to take the audience in, bringing in completely new ideas as the story progresses, though fortunately these are all quite interesting. The locals not knowing about Burke at the beginning suggests that something strange is going on, and as it eventually becomes clear that Knox is, in fact, a time traveler himself, it seems as though Knox may be following in the Meddling Monk’s footsteps. However, Knox proves just how formidable he is by revealing that he has trapped Edinburgh in a time bubble in order to study a virus that is killing another alien race. This is where the story falls apart, though, as he takes Burke’s place in history but then claims that his experiments are a failure since the locals are protected from the virus due to the large amounts of whisky they enjoy. Motivated by profit instead of claiming the alcohol as a type of curative or helpful measure, he instead opens up his affected temporal area to other paying customers as a theatre show of sorts. There are just too many different motivations behind his character, and none of them are explored to their full potential. The overabundance of potential motivations for Knox aside, the characterization of the supporting cast is actually quite strong. David Tennant is great as Daft Jamie, a man who is obviously the source of bullying but quickly takes to the Doctor’s kindness and shows realistic emotion to the ever-changing events and the eventual death of Mary, a streetwise woman played well by Glenna Morrison. Kevin O’Leary also puts in a good performance as Burke, but it’s ultimately Tom Farrelly as Hare who steals the show, playing a matter-of-fact man who justifies his actions to himself as he does his best to support his family. Colin Baker and Maggie Stables again offer their typically high-calibre performances as the Sixth Doctor and Evelyn, respectively, and it’s nice to see them initially on such congenial terms after the events in ‘Arrangements for War.’ Strangely, the Doctor acts a little bit out of character when he seems genuinely excited to meet Burke and Hare, going so far as to even congratulate them on their work. Obviously the Doctor accepts history and established figures, but it’s difficult to understand the reaction to those famed body snatchers when he is instantly deriding Knox for interfering before he knows what his true intentions are. It’s an odd situation, and it seems to unnecessarily put a little bit of a strain on the just-mended relationship between the two leads. The resolution of ‘Medicinal Purposes’ is fitting and heartfelt, Knox being able to withdraw into his TARDIS to see another day but not before being infected by the very virus he has been studying after Jamie touches him. Sealing Jamie’s fate fits with the tone of keeping history in check, but it’s still a depressing moment to end on after the road of rather mixed emotions taken to get to it.